"I have 6 (six) variants of this radio with the original UV-1D being my favorite! Back in 2011 when I first became a ham radio op, the Wouxun was the 'cheap' low-cost entry level rig (the world before baofeng). Coming in at nearly $80 less than the stellar FT-60 the UV-1D was right in my budget range. 8 (Eight) Years later, it's still my 'go-to' handi. While it's not my favorite HT (Kenwood TH-k20) it is the one I find myself using anytime I am forced to use a hand-held radio. Over the years I've added a pair of 2m/6m and 2m/220 versions as well as a few spare 2m/70cm rigs. When my eldest passed his tech test last year-he got a New Wouxun HT. As you can see I'm pretty heavily invested in Wouxun, and although I sometimes wonder if I'd been better off with an offering from the Big3 (unattainable in '11), when you add it all up ($) it seems like money well spent. K4CDN"
I picked up my first Chinese radio, the Wouxun KG-UVD1P in 2010 for $107. Getting a TERMN-8R for $138.89 in 2015 seems like a pretty good deal in comparison. I'm curious to know what others think. "I have the KG-UV2D radio at work; connected to a battery eliminator (in place of the battery) - which is connected to a 12vdc source and an external antenna. The reason I went into detail about this is because every evening when I power-down my work bench for the night - the12vdc source that runs the radio is also powered down. So, I am completely removing the power source from the radio every night - with the radio sitting dead for 12 hours before being powered back up again (and it's even for longer over the weekend). It's been 2 weeks since the repair, and my Wouxun has kept it's memory programming; without the slightest burp." So I had been using the KG-UVD1P as my mobile rig (video here). Over time, the heat in the car must have taken its toll on the radio as the display does not work. I'm not the only one who has had this problem. Sorry for the poor iPhone video, but there isn't much to show, so I think it will suffice. I had never seen this before... "Wouxun KG-UVD1P VHF plus Six Meters! Handheld"
Please understand what you are buying before you purchase this radio. This is not a VHF/UHF model. If you purchase by mistake and then ship it back , you will be charged a re stocking fee to cover the shipping cost. 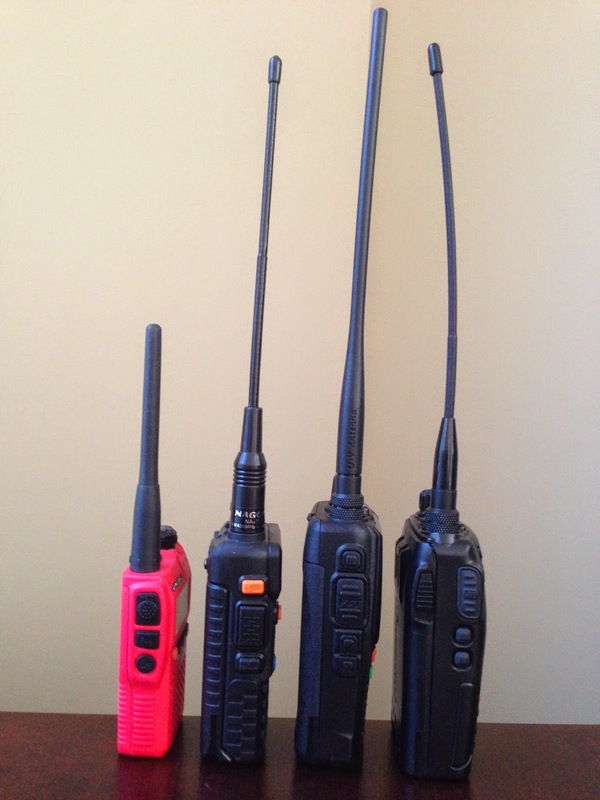 Dual band VHF/UHF. Freq. range: 136-174, 50-54 MHz RX and TX. KG-UVD1P 2 meters and 6 meters! Frequency Range of 136-174, 50-54 MHz RX and TX. FM: 76-108 MHz (RX). I take it all back. Now that I can get a jacket for my Waccom WUV-6R, I am all over it! I wonder if they will throw in a couple of free pens. "We declared, added models KG-UVD1P, KG-UVD1P V2, KG-UV2D, KG-UV2D V2, KGUV3D, KG-UV3D V2, KG-UV5D, KG-UV5D V2, KG-UV6D V2, KG-UV6D-E, KG-UV6D-A, KG-UV6D-R, KG-UV6X, KG-UV7D, KG-UV7D V2, KG-UV8D, KG-UV8D V2, KG-UV9D, KG-UV9D V2, KG-UVA1, KG-UVA1 V2, KG-UVA2, KG-UVA2 V2 basis of the original models KG-UV6D. These models are identical circuit, PCB LAYOUT to the original model, only the appearance and name are different. All models sharing the same FCC ID without permissive change would be electrically identical." 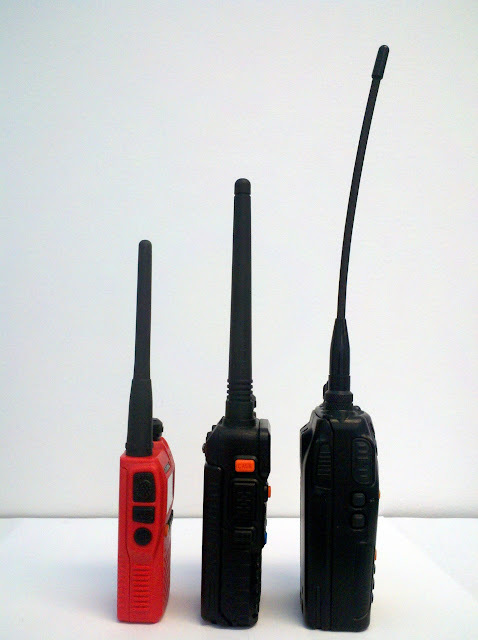 On the left is my Baofeng UV-3R. 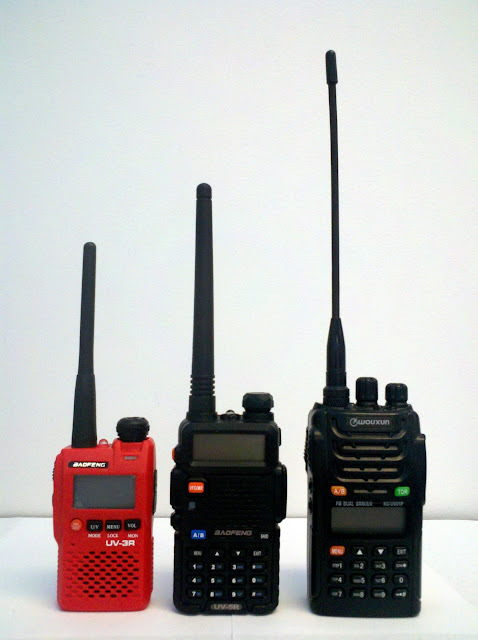 In the middle is the Baofeng UV-5R. On the right is a Wouxun KG-UVD1P. *When in Frequency Mode, the RPT button will quickly cycle through SIMPLEX, +OFFSET, -OFFSET, +REVERSE and -REVERSE to access repeaters. It can also be programmed for other functions. ** With the radio in "single display" mode, and with the Keypad, MENU and S/D buttons locked, the end user will only be able to turn the radio on/off, change channels and talk. This is perfect for the non-radio user. Nothing they do will get them lost in menu-land. I was poking around the Yahoo Groups and noticed that under the category of "Amateur and Ham Radio" there are about 7,200 groups. There are almost 200 with more than 1000 members. The Yaesu FT-817 has the largest group with over 12,000 members. The Wouxun KG-UVD1 group has 2,300 members and averages about 400 messages per month. 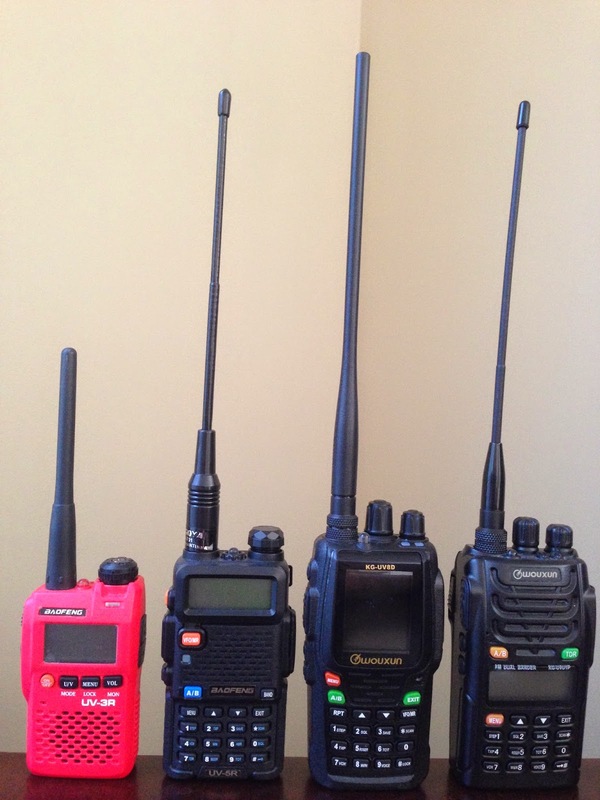 The Baofeng UV-3R group has around 1,900 members and averages close to 500 messages per month.